With so many food-related businesses, it's easy to wonder if all of the culinary gaps have been plugged. Now a few months in business, The Sauce Pasta Cafe, opened in 2018, has carved out a fresh pasta niche in Vancouver's West End neighbourhood. Serving up restaurant-quality pasta in a takeout-friendly environment is the modus operandi at The Sauce and I think it's a great addition to the dining scene. You'll notice the sauce of the pasta comes first. This naming pattern is consistent with how the menu is laid out. The beef shank bolognese was today's special sauce of the day and we had it paired up with fresh rigatoni pasta. This had a slight tang to it as all bolognese sauces do and a long savoury finish. I thought this was a good idea for a special as the other pasta sauces are mostly tomato sauces. The fresh rigatoni here was cooked to perfection, featuring an eggy flavour and lots of surface area for which to latch onto the sauce with. Next up was an à la vodka sauce paired with gnocchi. Unlike some places which might quicken their kitchen processes by using potato flakes to create gnocchi, the eatery assured me that their gnocchi was made by mashing real potato. The result was an extra pillowy sensation biting into each gnocchi. The vodka sauce, like the bolognese special, made for a long savoury finish to each bite, and I was eager for a new piece of gnocchi every time I had finished with the last. Last but not least, I had the new pesto sauce with spaghetti. Unlike the other kinds of pasta here, the spaghetti is the only one that's made from dry pasta. Being the thinnest pasta option I could entertain this. Dry pasta is also the ideal form for achieving an al dente bite (fun fact: fresh pasta uses eggs which changes the pasta composition). I enjoyed that the pesto sauce clung tight to the spaghetti. I could imagine feeling wronged with a pasta given too much olive oil and losing the ability to mix with sauce. Thankfully that was not the case here. Also, positive points for including pine nuts, an unoffending nut and common Italian ingredient, into the mix. To round out the night, I had a tiramisu to go. This isn't made in-house but was a fine addition for a takeout vibe. I'm sure the audience that comes in for fresh pasta takeout will also find this tiramisu an attractive option at $6. 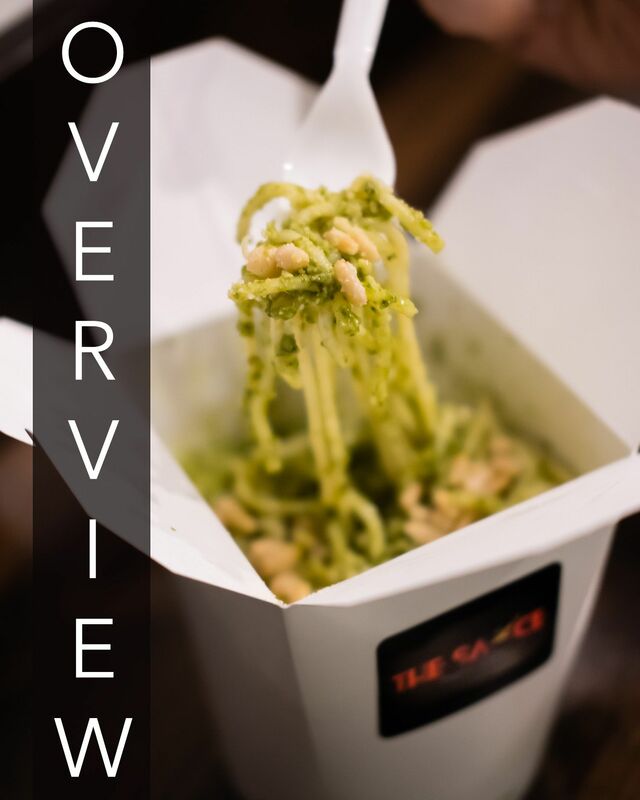 The Sauce Pasta Cafe is a small counter-service shop that is designed more for takeout than it is for dining in. There are roughly 8 stools along wall and window counters though I am informed actual sit-down tables are coming. The logo of the eatery shines bright in the otherwise empty wall. To my knowledge, nobody else in the neighbourhood offers fresh pasta at such an approachable price. $11 is nothing to scoff at when you take a look at the serving containers which are pretty large and hold the wet sauces quite well. If you're a value-hunter, The Sauce is a great opportunity to try out different kinds of pasta. A restaurant-replacement is a tall order (a restaurant has service and a little more ambiance) but if you're looking for something wholesome to take home quickly, The Sauce is a surefire way to fill that need.